We planted some daffodils in the grass verge outside Lloyds bank by Dunstall Close. It seemed a nice thing to do and that they would herald the spring. As it happens they didn’t do as well as expected, partly because the grass cutters were a bit exuberant and partly because of the cars that run over the grass in order to get to the cash machine. So the next year, we thought we might add to the number of bulbs and children came from Church End Academy and we planted loads more bulbs. We went away pleased with ourselves. We sent a more detailed map to the grasscutting chaps and were confident that this time there would be a glorious display. However, the cars continued to drive over the verge. It was decided that we should put up notices inviting people to respect the planting and to remind people that it was local children that had planted the bulbs for everyone’s enjoyment. This didn’t entirely deter the errant drivers, but the wheels tracks did lessen a bit. Unexpectantly in February some fragile shoots could be seen. And all of a sudden the valiant plants took off and we got our burst of colour. Miniature daffodils surrounding the classic daffodils. And in the wind they did indeed nod and dance in the breeze. The grass cutters came and carefully mowed round the plants, so the area looks cared for and at the same time showy. Well, we had our Rescue event at the end of March. 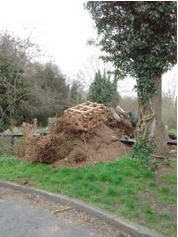 Long time local people would know that we clear up the worst of the litter spots in Tilehurst. On the Saturday morning, the Triangle area was litter picked and really it looked quite nice and inviting. Part of the Rescue deal is that volunteers who come and help with the Rescue effort are entered into a raffle prize. The prizes are donated by local businesses in recognition that everyone benefits from the area being tidy and that the people who come and clear the litter do so as volunteers. This is what seems to be known as a win win situation! So after the event, there were raffle prizes to be delivered. As I was travelling towards Chapel Hill I noticed two women walking up Park Lane each with a bundle of freshly picked daffodils in their hands. I did think that this was uncalled for and that they had probably picked them from Langley Hill. No, ladies, they weren’t planted for you to pick. They were planted for us all to enjoy. I was saddened. However, I had raffle prizes to deliver. Which I did. On my way back I passed the verge by the Lloyds Bank and there strewn in the road were all the daffodils from our verge. Just moments before when I had passed the verge they were bobbing in the breeze, and now they were in the road. My heart sank. I drove back home, and snatched up my camera and walked back up to the Triangle. I took pictures of the poor flowers in the road wondering about the mentality of mankind. 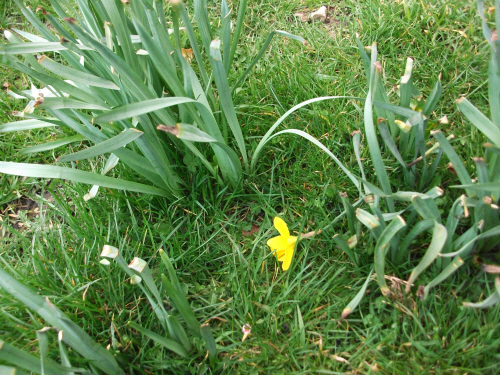 When I looked carefully I noticed that quite a bit of litter had also blown in amongst the plants so I carefully laid the picked daffodils on the verge and picked up the litter and took it to the bin hoping that it would stay there and not get blown out by the wind. I walked back to the verge and noticed that there were a number of daffodils with broken stems. In other words they had been picked but left to die. I took out my camera again to photograph the poor flowers. 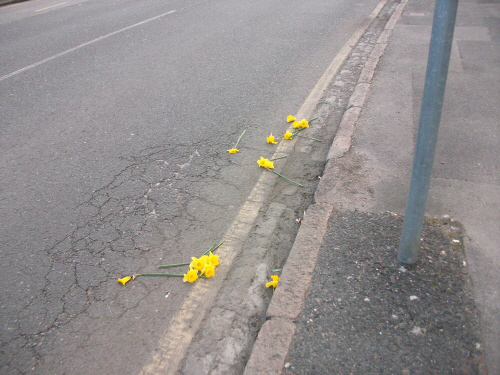 Then I picked up the daffodils that had been in the road, had a last look round at the sad state of affairs. I then heard a booming voice “Why are you picking the flowers. They are not just for you they are for everyone.” I turned and looked to see where the booming was coming from. A car had stopped in Dunstall Close and the driver was hurling words and bad looks at me. “Yes I know” I said. “Well why are you picking them then, that is mean and disgraceful behaviour”. “Oh golly, I am so sorry” said the driver. What a strange mix - the destroyers and the protecters. Haven’t we got better things to do…. As a footnote to the story we were pleased to see that many of the daffodils round the newly planted tree had valiantly recovered and gave a good show. In 2011 a bunch of volunteers planted loads of bulbs outside what was then Upcroft School. The school is now called Meadowpark Academy. Every year at this time of the year, the daffodils have burst through giving a blaze of light at the entrance into Tilehurst. On the other side of the road some trees were planted and with them some more daffodils. In Tilehurst Globe, we like to say that we make a difference but it seems that although we do make a difference, it is not enough for everyone. A man was walking his dog up Norcot Road the other day, and he saw to his astonishment, that a boy was cutting down the daffodils. He had managed to cut down almost half of them. And they were left on the ground. No-one was taking any notice of the little miscreant. However, the man with his dog saw that the boy was from Meadowpark School and rightly reported him to the school authorities. Then, on the other side of the road, where the trees and daffodils have been planted, there appeared lots of bike tracks in the grass. 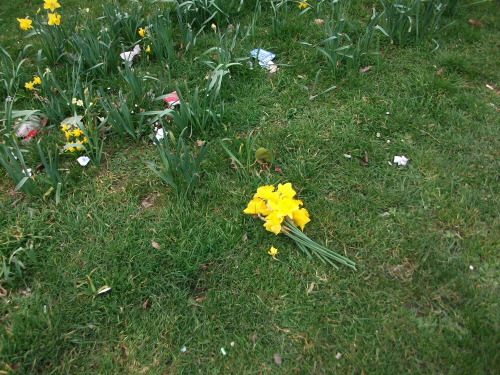 Inevitably, a bunch of daffodils where trashed too. If you read the reports about our efforts over the Rescue Weekend (see the link below), you would expect that people would be pleased with the clean and tidy McIlroys Park and Blundells Copse where we put most of our effort. It was therefore rather upsetting to find on the Monday after Rescue at the entrance into Blundells Copse that a builder had piled some waste material at the entrance into the copse.